A few months ago gasoline cost about $3.80 a gallon. Then it dropped considerably over several months to hit a low price around $2.10. Now gas has gone up again and peaked around $3 to then turn around and drop a bit. It doesn't take much research to see that these price changes are a direct reflection in the cost of oil. Oil has gone down a lot in the past 12 months. But will oil go up or down in the next 12 months? What about the next 5 years? We don't know what oil will do in the next year or ten years. You can really only take guesses at this kind of thing. But we might get a reasonable expectation for the cost of oil and hence the retail cost of gasoline by looking at the history of gasoline and oil prices. If you look at the first 30 year period in that chart from 1972 to 2002 the cost of oil started around $1.50 and ended around $1.50 (both in 2013 dollars). I would conclude then that over the longer term in that 30 year period oil basically rose at the price of inflation. Of course there is a 10 year period there in the 80's when oil shot up and then dropped. Now in the more recent decade from 2002 to 2013 we see oil has again shot up in prices. That more recent increase in price would seem a direct result of major conflicts in the middle east. 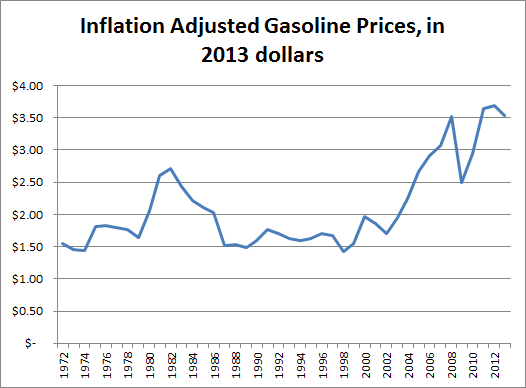 In the past 40 years gasoline prices have risen over the long term at least as fast as the cost of inflation. In the most recent decade gas has risen at a rate about 8% faster than inflation. In individual years gas has risen or dropped as much as 25% above inflation. In a 5 year period gas has gone up as much as 80% over inflation. Generally I'd conclude that gasoline will go up at least as fast as inflation in the long term. In shorter periods we could see gas go up or down 25% a year and even double in cost within a decade. I think this is a good one to share since its not got a lot of solid public schools rather than for profits. This is an older one but I thought it was worth a share. For a while now I've played the game MyVegas Slots on FaceAndroid app for MyVegas Slots is on Google Play. Its just a simple time killing slot machine game. Every time I play slots I end up losing all my money in varying speeds, so I prefer to play it on a free game like a Facebook or Android app. An extra reason to play MyVegas Slots is that you can earn Loyalty points that can be redeemed for actual Vegas services or goods. I just had a run of good luck this afternoon and piled up around 2500 Loyalty points and got over the 10k point threshold which gets me into the territory of some rewards that are actually meaningful. It has taken me a while of playing the game to hit the point that my loyalty points are actually worth some more meaningful rewards. But if you've got some time to kill and like playing slots games then why not? You can get some meaningful rewards once you hit the 5000 to 10,000 point level but free rooms seem to start around 15k points. With the free rooms they don't list all the terms an I suspect that you have to pay taxes and fees which can be substantial. I should point out that the value of some of the rewards may be a little dubious. For example there are a lot of 2-for-1 deals or companion ticket deals in the cheaper rewards. Its not hard to find coupons or discounts for 2-for-1 type discounts in Vegas so cashing out loyalty points for that might not really be a great deal if you can just get the same discount for free elsewhere. Things like straight cash credits, monorail tickets, room comps and free buffet meals have more direct value. Free buffet meals seem like good deals to me. But even there you have to check the value, it seems that the 2 person buffet deal at Palace Station is only worth about $14 but costs 21,000 loyalty points but you can get a Mandalay Buffet for just 11,500 points that normally costs $22. So spend 23,000 loyalty points on two of those and you get two buffets that are valued at $44. Note: I am not getting any commissions or compensation for this article and there aren't any referral links here. Addendum added April 8th: I wanted to update this to add some points. Do not buy chips in the MyVegas game. The game frequently prompts you to buy chips and if it isn't obvious, that is not a good deal. The idea here is to get stuff for FREE not pay for chips. You're not going to make a lot of free bonuses playing this game and it will take time to build up chips. I played for a few months before I hit enough points to get a decent reward. 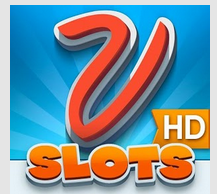 If you like playing slots games like this then this might be a fun way to get some free Vegas stuff. Otherwise I'd recommend spending your time elsewhere. I play on Facebook and the android app works differently. I tried the app but it didn't work well on my phone. You can use the auto spin method and let the game play multiple spins while you're busy doing something else, that helps move things along. You'll do best if you play a few minutes a day and make sure to cash in all your free chips from your buildings. Update May 7th: After about 6 more weeks of playing the game pretty regular I"m now up to 40k points. I usually have the game playing in a separate browser window while I'm doing other things and then just use autospin and check once in a while to click ok. I occasionally see deals on computer parts like deep discounts or even free-after-rebate (FAR) promotions. I figured if I was patient and collected parts one at a time via these deals that I might be able to build a computer for a deep discount. That does not include a monitor. Also note that I'm going with a dirt cheap 120GB drive there to cut cost and thats not much storage. I could spend $30 more and get a 1TB drive though. I'm not listing a CD/DVD drive here because you don't generally NEED them nowadays. It would be handy to have one but its not a requirement, but installing software can be tricky without them. I do have a USB portable unit at home I can use though. Dell basic desktops start at about $199 on sale. So it would not make sense to build my own basic spec. system when I can just buy a Dell unit for less money. I rarely if ever see deep discount or FAR sales on processor or the operating system. Once I saw a sale for a processor & motherboard combo for $30 so there are deals out there but they are rare and I'd have to be patient and diligent to catch them. The Windows operating system though doesn't seem to go on deep discounts or promotions. Newegg happens to have Windows 7 on sale for ~$80 right now but thats about the best deal I recall seeing. I see people selling versions of Windows 7 on eBay for about $50-70 range. I'd be suspicious that those aren't legitimate copies of Windows but the ones I looked at didn't have any signs of being pirated. (at least as far as I can tell). I figure if I do it well and catch some good deals and FAR promotions I might get all the parts for something around $100 excluding the OS. I could then use a free OS like Linux to build the system rather than Windows. Or I could go up to about $150 and get one of those cheap Windows discs off of eBay. Still thats only about $50 less than a fully equipped prebuilt system from Dell if I go for Windows which is hardly worth the effort. How well this might succeed though all depends on what kind of discounts I might find. If I can find a bunch of great FAR discounts on the parts then I might be able to build a PC for almost nothing in out of pocket cash. Thats pretty unlikely since most parts don't get FAR deals. But I should at least be able to do something pretty cheap. This is mostly just an experiment for fun and we already have a good computer at home I built a bit ago. I don't know what I'll do with the computer I will build with this project. I might just donate it or I could probably sell it. So anyway... here's the plan : I'll shop around and keep my eyes open for good deals on discounts and rebates on computer parts. I'll then buy the parts as cheap as I can find them one at a time. In the end I'll build a cheap computer. I am not sure what OS I'll use on the computer at this point. Part of rental investing is property appreciation. You don't want to count on appreciation too heavily but you can certainly benefit from it. Generally I expect real estate to appreciate roughly 3% annually long term. Of course that varies a lot from location to location and region to region but overall I think 3% is a decent baseline. As it turns out our rentals have appreciated about 3% total thus far. 4 of our properties are up in value and one has lost value. The cheaper two properties are up significantly more. The other two properties are up 2-3% range. If I sum up the total amount paid versus the total current value and then use 2002 as a rough average purchase date then the growth comes out to 2.9% for the lot. Some good categories here. Chase & Discover both have Restaurants and I'm sure I will spend some small amount of money at the Home Depot. The Big Picture tells us How much do you need to make to buy a home in your city? We hear a lot about the rising cost of tuition at universities. But the numbers that are usually reported are the published tuition rates. Thats kind of deceiving though. Most people don't pay the full tuition rate at universities due to financial aid and scholarships. The "net tuition" is the amount that students actually pay after grants and scholarships. To get a better idea of what college costs are really doing its better to look at the net tuition rates. I got the data out of the College board trends in college pricing and then looked specifically in figures 12 & 13. Those figures are reported in 2014 dollars so I adjusted back to current figures using their CPI numbers in table A2. 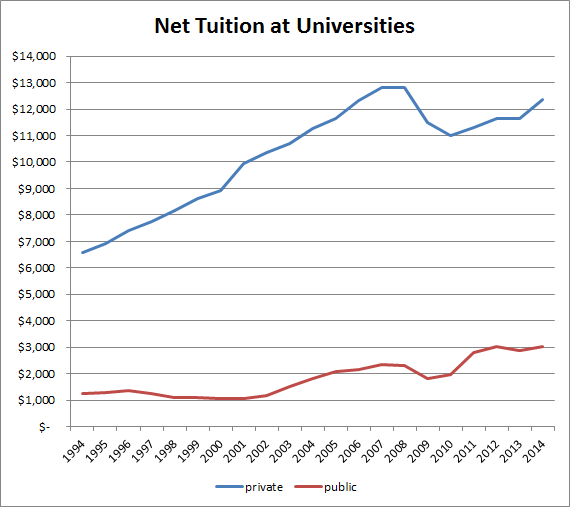 Interestingly you can see that net tuition at private universities is actually down from 2007 to 2014. Of course nobody is reporting on that. In that same period published tuition rates are up ~33%. So while the press can say that tuition is up in the past 7 years the amount that students actually pay is down. In the past 20 years net tuition at private schools is up 3.2% compounded annually and 4.4% at public schools. Property taxes are one of the larger expenses for our rental properties. Our largest expense is mortgage interest but property tax is the 2nd largest regular expense. The taxes generally go up over time but they have gone down on occasion. The taxes go up due to new levy spending being voted in or due to the property appreciating in value. They might go down if a older levy expires and isn't replaced or if the property assessment is dropped. I can pull the property tax records off of Zillow. They get it out of public records apparently. Property A & D are in the same state & region, property B& C are in another city in another state and property E is in yet another state. Property E saw our taxes go up significantly in 2010 because a homestead exemption expired which happened after my wife moved out of the house and we turned it into a rental. After that values dropped due to property value assessments in the area going down. Now the historical pattern doesn't really mean all that much here. Any given year a city might vote in a really big school bond and I might see my taxes go up 5 or 10% because of it. 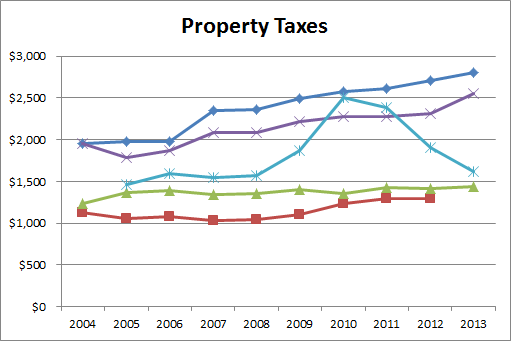 The taxes are also tied to property value so if values go up then my taxes go up. How our property taxes will change in the future years depends on local votes on spending and property values. But without any other information I'd expect our taxes to go up at rates similar to what I've seen in previous years. So I think that figuring for roughly 3-4% annual increases in taxes as a baseline is fairly safe assumption. I've never really seen the need for huge personal wealth, but I am envious of flying in private jets. Not that I spend my days and nights crying over it but it does seem like it would be pretty enjoyable to fly in a private jet. Its one of the things I'd think about doing if I were to win the lottery or otherwise fall into vast wealth. But how much does it really cost? From what I gather it costs in the ballpark of $5000 or more per hour to fly in a small private jet. Thats basically the entry level prices for private jets. So that means a short 1 hour flight from Los Angeles to Las Vegas in a small jet will cost in the ballpark of $5k. And when I say a small jet I mean small. Those small jets only seat a few people and the headroom means adults have to stoop when they are not seated. They might only carry a few bags worth of luggage. Medium size and larger gets will cost more. I tested both on a short 1 hr flight round trip (2 hr total) and got quotes of about $10k for the trip in a small jet. Those rates are for charter flights. You can also buy hours in bulk from operators like NetJet and others. Private Jets for Everyone? from Travel and Leisure pointed to a few different companies that sell basically pre-paid private jet accounts with typically 20 or 25 for ~$110-130k or roughly $5k per hour. Clearly spending $5000 for a 1 hour flight is not frugal. But its not as awful if you consider that you can fit 4 or more people in that plane. Lets say you've got a family of 4 and you're flying round trip for that 1 hour distance. That comes to $2500 per person. Flying first class for such a journey would probably run you $500 a seat. Of course you can fly economy for $200 or so. Probably the most frugal option to fly in style is to get the economy tickets then upgrade to first class using miles. I'm a far cry from being able to afford to fly via private jets. So please share this story with 50 million of your friends so this blog can become super successful then I can sell out for multi millions.